St. Florian—an officer in the Roman army who died protecting his faith—is without a doubt reaping his reward in heaven as promised by God. Put to death for refusing to kill Christians as ordered by Emperor Diocletian, St. Florian is the man who has been given the title of patron saint of firefighters and floods. Florian was born in 250 AD in Cetium, what is now Austria. As a young man he joined the Roman army, and proved to have the makings of quickly climbing the ranks. The emperor at the time—Diocletian—recognized his dedication and ability to work well with people, and appointed Florian to a high administrative post in Noricum, now part of Austria. However, Diocletian had no intention of using Florian to do good deeds. During the Roman Empire, the rise of the Christian doctrine was not tolerated. Anyone proclaiming to be a Christian was sought out and punished by being put in prison or to death. The only way Christians could be spared prison or death, is if they were willing to renounce their religion and offer sacrifice to the Roman gods or emperor. As an official working under the Emperor, St. Florian was expected to carry out his duties persecuting Christians in the areas he commanded. Angered that he was being disobeyed, the emperor sent one of his assistants, Aquilius, to speak to Florian. When Aquilius asked Florian why he wasn’t fulfilling his orders, Florian replied, “Tell the Emperor that I am a Christian and will suffer the same fate as the Christians.” Stunned by Florian’s confession, Aquilius tried to entice Florian into abandoning his faith by offering him a promotion. Florian would not be swayed. In retaliation, Aquilius ordered that Florian be whipped and beaten. In response, Florian expressed that he wouldn’t mind enduring a “few scratches” for his faith and personal beliefs. Becoming angered and fearful that Florian would convince other Christians to rebel against him and the emperor, Aquilius ordered his soldiers to burn Florian to death. When Florian surrendered himself to Aquilius’ soldiers, he stood on the pyre (structure made of wood) with confidence. Rather than being fearful for his impending death, Florian challenged the soldiers to go ahead and light the fire, saying, “If you do, I will climb to heaven on the flames.” Irritated, Aquilius decided not to burn Florian, but instead ordered him to be scourged and drowned by throwing him into the Enns River with a rock tied around his neck. 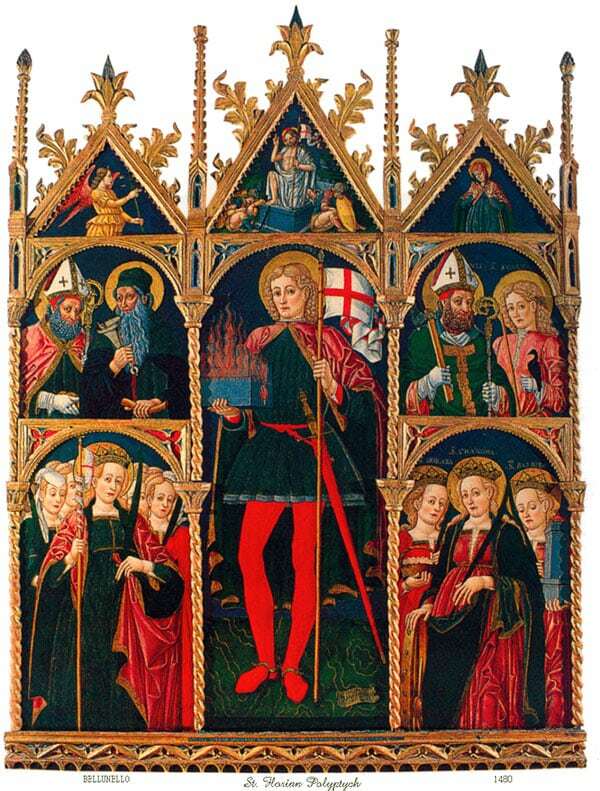 St. Florian died 304 AD. His body was recovered and he was given a proper burial. 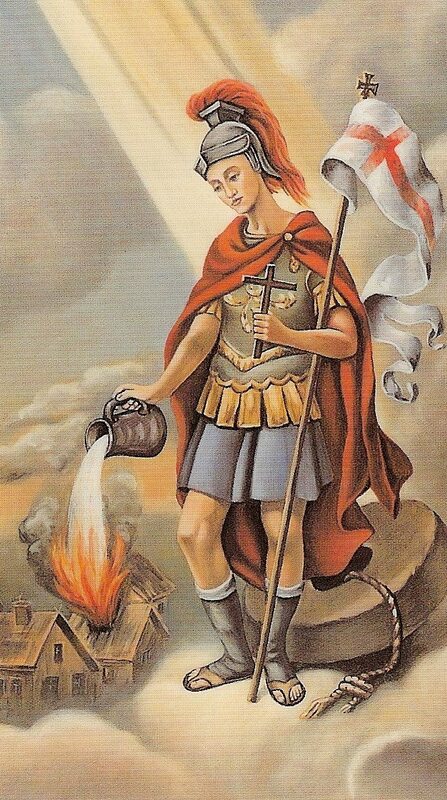 There are several reasons why it’s believed Saint Florian earned the title of patron saint of fire and firefighters: legend says that during his life, St. Florian put out a massive fire with only one bucket of water, saving a village from ruin. St. Florian is often depicted in artwork pouring water from a bucket or small vessel. Many years after St. Florian’s death, a man said he was saved from a deadly fire when he called on St. Florian, begging for his intercession. 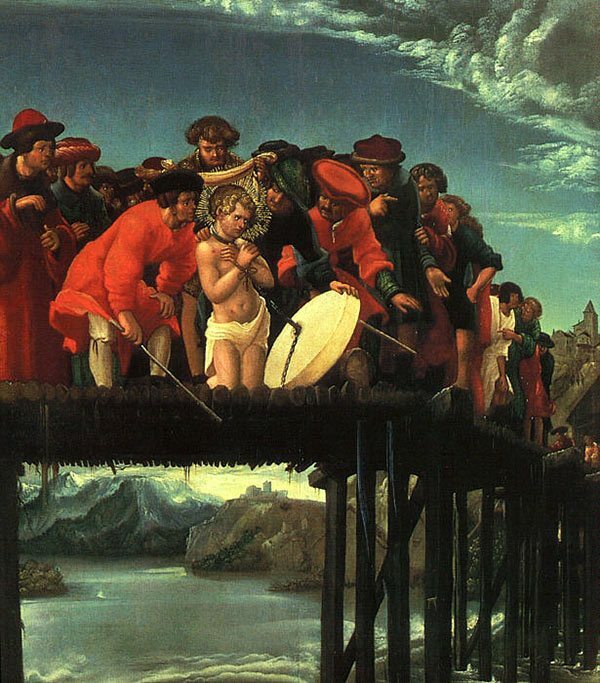 Because he was killed by drowning, Saint Florian is also often sought out as protector against the dangers of water including drowning and flooding. 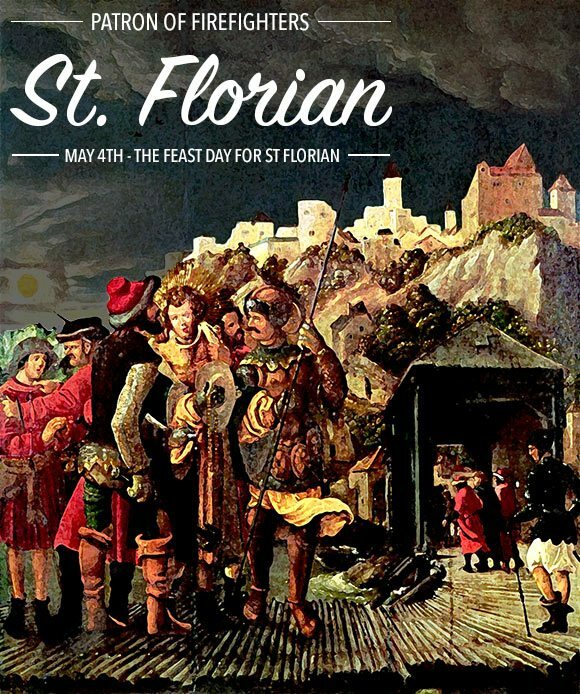 The feast of St. Florian is celebrated May 4, coinciding with International Firefighter’s Day. 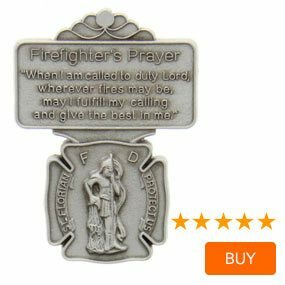 If you have a loved one who is a firefighter, consider giving them the gift of St. Florian’s protection. 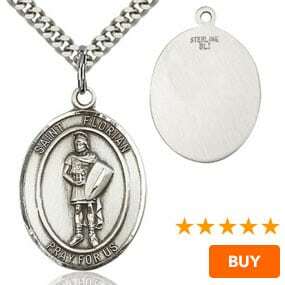 Medals, pendants, visor clips, and prayer cards with the image of St. Florian on it can be worn or kept nearby as a reminder to pray to the saint for his protection in the most dangerous situations. 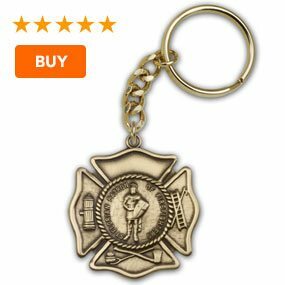 "i bought this as a Christmas present for my brother who is attending fire academy next week. He loves the keychain. Thank you very much! " I bought this as a gift for my honey. He was very touched by this pendant. I was very pleased with the purchase and quick delivery. 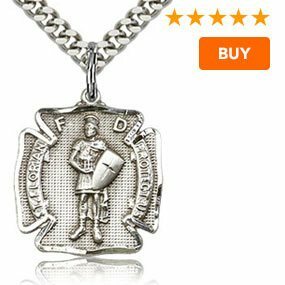 In this classic depiction of Saint Florian we find his image on this pendant as that of a strong Roman soldier holding a shield. A very good account of Saint Florian. I am a firefighter for the city of Lawrence Kansas. My wife Emily and our family live in Saint Marys Kansas where I also volunteer for the fire department. We had recently acquired 2 statues of St Florian from my brother who is currently residing in Germany. Please let us know if you have any further information on St. Florian. Check out the May 2000 issue of FIREHOUSE magazine for a true story about this Saint.